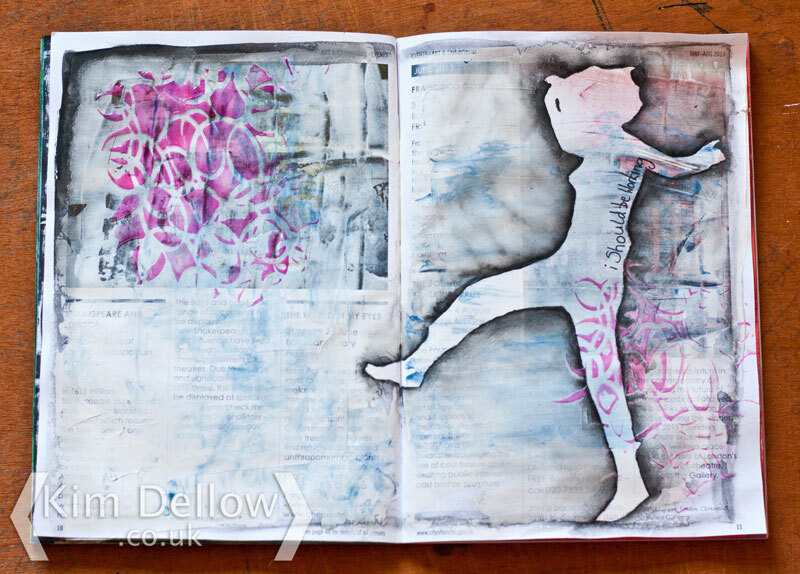 I have a new, fresh off the press, double spread art journal page to share with you on Art Journal Sharing Thursday. The inspiration for this double page spread was a little haphazard. I knew that I wanted to have a figure shown as negative space on a page and I had all these plans to do a collage based page and then I opened my journal. I’m working in the A5 flier again so it already had the lovely printed pages to work on. I’d coated a few pages with gesso a few weeks ago and this double page just happened to have some extra bits and pieces from previous projects. I had used it to mop up some blue ink and I had pressed a mask covered in tinted clear texture paste into the pages a week or so ago. So it just seemed ready for a bit more work, I used a mask and a watersoluble graphite pencil to add the figure of a jumping woman. The theme sort of appeared as I was making the page, the thoughts in my head were about working. I’m one of those people who just can’t stop working. Even when I’m supposed to be relaxing I’m either worrying or thinking about work which isn’t entirely productive I can tell you! There is always the underlying feeling of guilt associated with downtime for me so even though she looks like she is having fun I’m sure she is thinking ‘I Should Be Working’. Of course you could interpret it the other way around, she could be gleeful that she is playing hooky from work. I’ll leave it up to you to decide which interpretation you prefer! 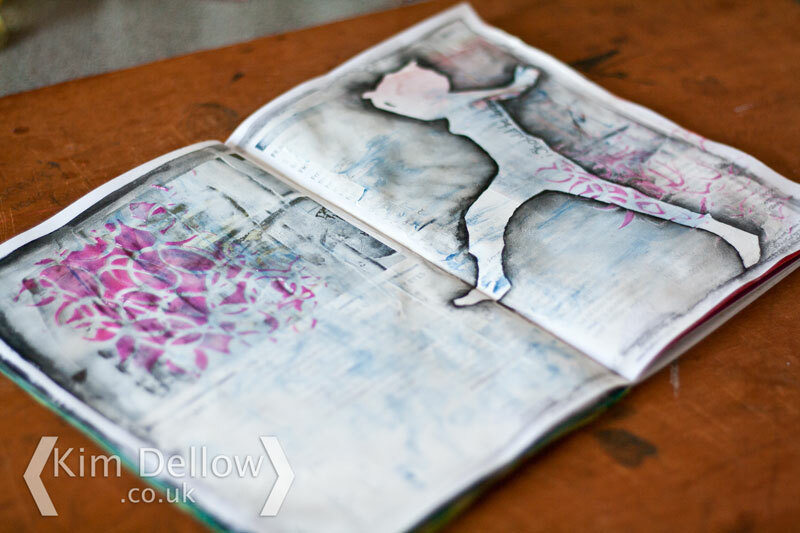 Thanks for popping in today and please do share any art journal pages you have been playing with this week. Its fabulous and loving that silhouette with the black around it which just makes it pop from your page!! 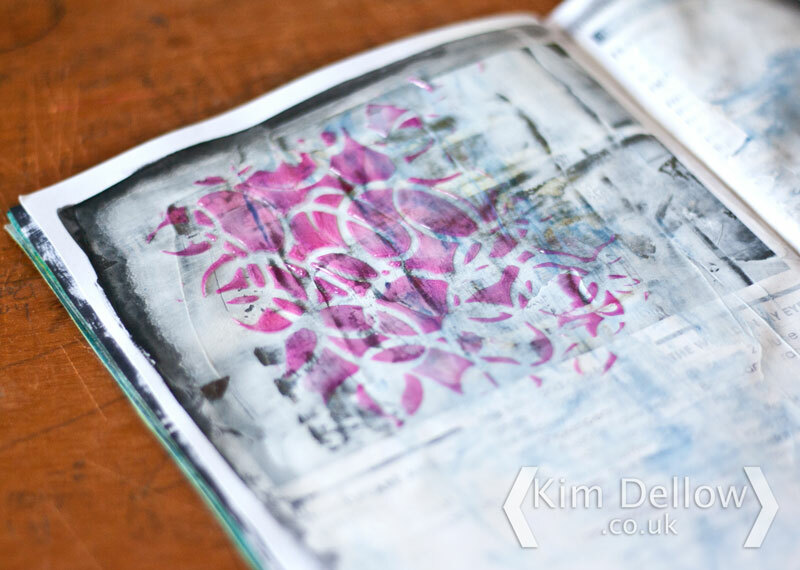 Stunning art journal page with amazing textures! This page is simply stunning !!! The more you share your pages, the more it emerges that you are an artist, Kim. How did you get into science in the first place? Not a rude question – I was a maths-specialist primary schoolteacher and now I favour arts & crafts & writing. What did school do to us? Life leads us whither we should go! 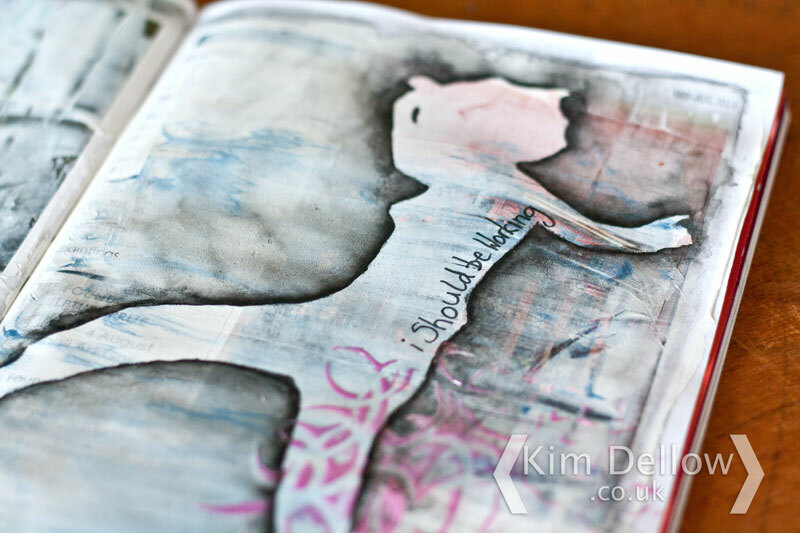 Kim, I just love your journal pages and the lovely image just stepping off! Love the shadow! Hugs! Stunning art journal page with the fun colors. 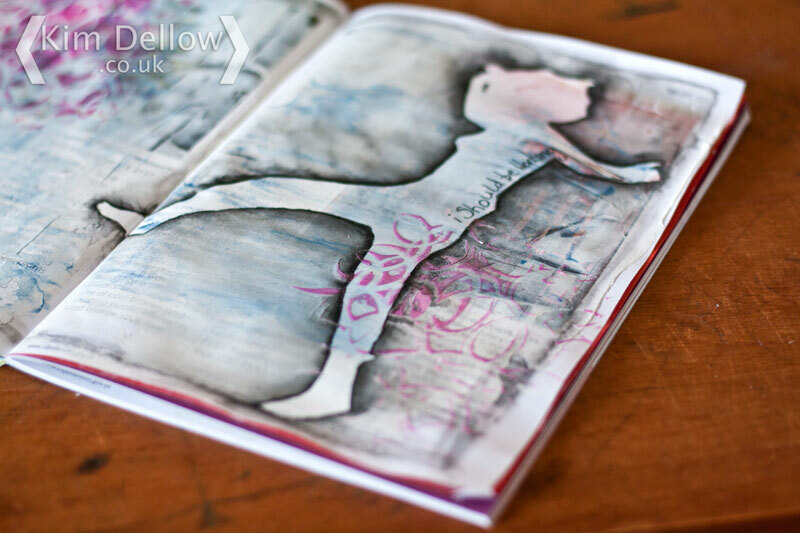 Such beautiful pages Kim – I love the colours.